Bouchon Bakery - Las Vegas, Nevada. The Pantry - Las Vegas, Nevada. Prior to my trip to Las Vegas I had researched some of the top most popular restaurants to visit. Many of the recommendations were from friends and most couldn't stop raving about Bouchon Bakery as I had to make a visit to see what it was all about. In a later post I will go into more detail on Bouchon Bakery, but upon first arrival I was awe struck by the beautiful geometric medallione prints floating seamlessly through the room. The colors were unexpected and matched perfectly with the blue velvet banquettes running alongside. The Pantry was located inside The Mirage, it was a very popular brunch spot because it had a line out the door every morning. 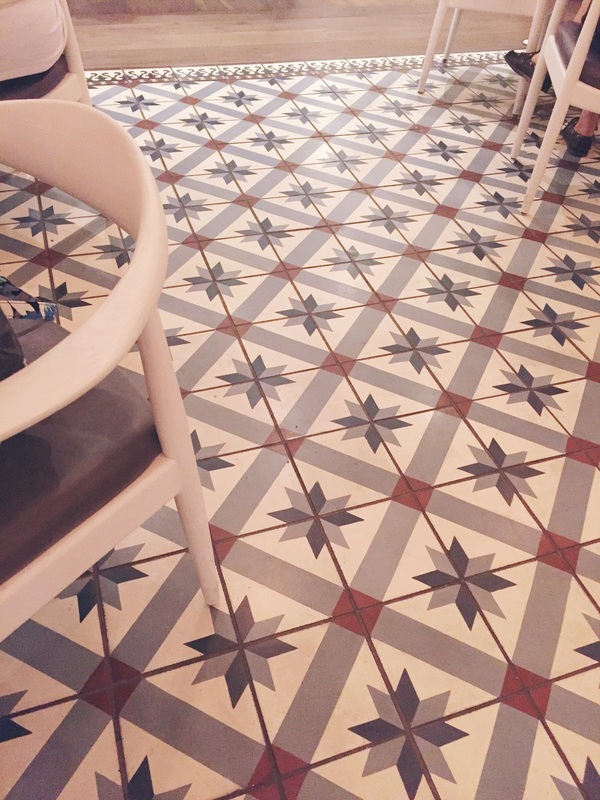 The colors throughout the space were mixes of neutrals and warm tones, which blended perfectly with the starburst diamond tile madness happening below our feet.